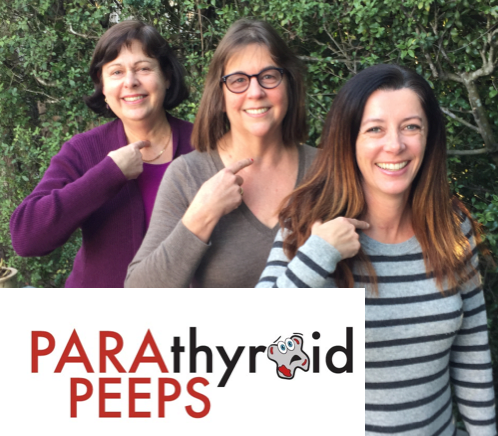 We once again welcome Barbara Creamer, Joyce Arnon and Sophie Freedman also known as the Parathyroid Peeps. Primary hyperparathyroidism is a secondary cause for bone loss so the ladies will help to raise awareness on this little-known disorder. Does pHPT have complications we need to know about? Yes. The excess calcium in the blood stream can cause serious complications over a period of years. The calcium interferes with digestion and can lead to GERD and ulcer formation.The excess calcium can deposit in the kidneys as kidney stones and ultimately lead to kidney damage.Excess calcium in the blood can cause calcification in the blood vessels and ultimately heart disease and heart attack. Left untreated, calcium can be deposited all over the body and cause calcification of various organs.Depletion of calcium from the bones leads to osteoporosis and fractures. Ladies, what has your personal experiences been with pHPT? The three of us experienced many of the above symptoms. We all experienced bone pain and two of us had DEXA scans indicating osteopenia. Barbara had the disease the longest and therefore suffered from more ailments - gallstones, kidney stones and calcification of organs to name only a few. It is important to note that everyone will have some but not all symptoms. For example, Joyce suffered from GERD, pain in the femurs, anxiety, and depression, while Sophie was unable to sleep at night, was losing her hair, and had bone aches in her rib cage. We all suffered from brain fog.One can feel trapped in the body of a much older person, joints can ache, and the ability to focus is diminished. The fatigue can be all consuming. Barbara went undiagnosed for 8+ years with calcium values clearly outside of the normal range. Her adenoma was attached to her vocal cord. Expert surgeons removed it successfully without damaging the nerve. A less experienced surgeon would have likely left part of the adenoma behind in an effort to avoid damaging the vocal cord and she would not have been cured. Joyce had a hard time getting diagnosed because she had the atypical normohormonal presentation with high calcium but normal PTH.She had one adenoma but also had a second bad gland that was normal in size, producing too much PTH; therefore both were removed surgically. 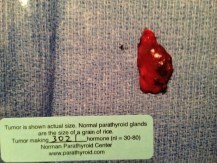 If all four parathyroid glands had not been checked, the second gland would have been overlooked. She would not have been cured and would have needed another surgery a few years later. Sophie had to self-diagnose using the Calcium Pro App as her doctor was dismissive of her lab values. She was told that she had nothing to worry about. After self-referring to an endocrinologist she was told to wait and see until the disease progressed and she was given Fosamax® to help with osteoporosis. Instead Sophie self-referred for surgery at the Norman Parathyroid Center where her adenoma was removed in 18 minutes. There are no drugs that can reverse the disease process and make the adenoma shrink or disappear. Surgical removal of the parathyroid adenoma is the only cure. It is our understanding that the drug Cinacalcet is used to treat those with secondary hyperparathyroidism, which is hypercalcemia that is secondary to kidney disease. It is also sometimes prescribed for those who are not eligible for surgery and/or who have had failed surgeries and cannot be cured.Additionally, the osteoporosis drugs (Bisphosphonates) cannot improve bone density when an adenoma is present. What advice would you give to someone newly diagnosed? ****Become an informed patient: Request copies of your lab work. Understand that the normal ranges for calcium values vary slightly from lab to lab, but more importantly often do not take into consideration variations for a person’s age. Adults over age 30 generally feel best with calcium values in the 9’s with an upper limit of 10.1. _Pick your surgeon carefully: _ All endocrine surgeons are not created equal. Some surgeons only remove the parathyroid gland with the adenoma that is seen on imaging studies, such as Sestamibi scans or ultrasound scans, and do not look for other bad glands.Others will do exploratory surgery for several hours in the hope they can find the bad glands, as they are very difficult to locate. As a result, excessive scar tissue forms, making it far more difficult and sometimes impossible for a patient to have a successful second surgery if this becomes necessary. It is important to find an expert surgeon that has performed hundreds of parathyroidectomies. Ideally, they should know how to locate and assess the 4 glands in under an hour. Some surgeons, like the ones at the Norman Parathyroid Center in Tampa, FL will do a complete surgery, checking all 4 glands, in less than 30 minutes on average. Ours were all 21 minutes or less. I understand you have a website, Facebook page and Twitter account: what led you to start these support sites and what is your goal for them? _We wanted to do something to help educate the community – patients, medical and mental healthcare professionals, about hyperparathyroidism, which is an under-recognized and under-diagnosed illness._We all had a difficult time getting diagnosed. We had to do a lot of research on diagnosis and how to find an experienced surgeon, and had to advocate for ourselves. Our goal is for diagnosis to be timely so that patients do not suffer needlessly for years.We would like to see diagnostic criteria change at the national level, and ensure that all patients suffering from this condition are able to be surgically cured by expert surgeons so they can move on to better health. To learn more about primary hyperparathyroid disease, read the PEEPS stories and blog, as well as listen to a series of educational podcasts they have produced, visit www.parathyroidpeeps.com. Like on Facebook @parathyroidpeeps Follow on Twitter @parathyroidpeep. Thanks for a very informative interview on primary hyperparathyroid disease.